Jennifer Carter’s first introduction to comics involved Donald Duck. She has somewhat progressed from these gallinaceous beginnings to include a love for pant and spandex wearing super heroes. She has a particular passion for female-led story lines. When not writing or reading, Jen works with Portland youth on issues of food justice. Swordquest #1 begins in the Atari exhibit of a video game museum. In the opening panels of this new Dynamite comic, a sword is displayed prominently encased in glass. Fans will immediately recognize it as the “Sword of Ultimate Sorcery,” the ultimate prize in a five-round tournament. Each round corresponded with a new game in the Swordquest series, but Atari cancelled the series after the third game and the sword never found a home. If you’d like to read more about this mystery, check out the full story here. In Chad Bowers and Chris Sims’ world, the Sword of Ultimate Sorcery appears to be sitting awaiting it’s champion. Peter Case is just such a champion, sort of. Case, a middle aged man who has lost his home and given six months to live (see Swordquest #0), is on the hunt for one last adventure. While digging through boxes in his childhood bedroom, Case remembers his early obsession with the 1980s Swordquest series. Case and his friends Amy and Alvin Perez had a fixation on solving the puzzles of the Atari games and corresponding DC comics in order to win the ultimate prize. They dutifully mailed in their answers and kept a notebook of strategies. However, when the series ended after the third game (Waterworld), the friends moved on with their lives. Now in their forties, these characters find themselves drawn back to the quest for both Sword and glory, in this charming 1980s nostalgia piece. The art by Ghostwriter X echoes the pixelated style of Atari 2600 games. The best examples of this style include a Pac-Man-esque creature devouring Case in a moment of emotional confrontation and panels devoted to player “Game Tips.” The style and throwback design elements are a nod to the book’s concept that the Swordquest game never ended for Case and the Perez siblings. Bower and Sims’ characters are both players of, and characters in, Atari’s game. Whether you played the original series or are just a fan of ‘80s nostalgia, this series is worth a read. Its combination of heartfelt throwbacks and genuine attention to the struggles of growing up makes this comic stand out. Check out all of our Swordquest issues and don’t forget to subscribe! 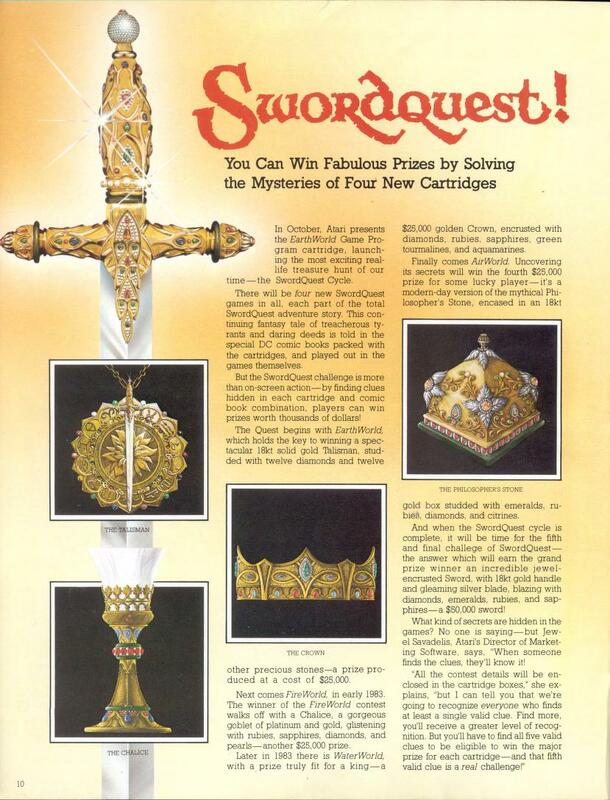 In the 1980s, video game giant Atari announced a new series: Swordquest. Tod Frye, the designer of 1979’s Adventure, would act as the designer for this new franchise. In each of the four Swordquest games, players would help twins Tarra and Torr defeat the evil Tyrannous and reclaim powerful artifacts. However, Swordquest had a unique twist: players would also compete in the real world for treasures based on the in-game artifacts. These treasures were the “Talisman of Penultimate Truth,” the “Chalice of Light,” the “Crown of Life,” the “Philosopher’s Stone,” and the ultimate prize, “The Sword of Ultimate Sorcery.” The trophies were solid gold and encrusted with diamonds and gems, and reports claim that the items had a combined value of $150,000. Individually, the estimated value of each item was $25,000. In 1982, Atari was the subsidiary of Warner Communication, which also owned DC Comics and Franklin Mint. DC created the comics to accompany each of the four video games while Franklin Mint created the treasure. Each game featured a number of clues hidden deep within them. After finding these hidden clues in the game, the players would go to corresponding pages in the accompanying comic book to find words hidden in the images. Then, they would create phrases based upon these words. After finding the correct answers, players would mail the multi-medium puzzles directly to Atari. Atari invited each winner to their headquarters to compete in a one-day tournament, with the winner receiving a glittering prize. The popularity of the contest caused Atari to quickly change the plans of at least one contest. Fireworld sold 500,000 copies and resulted in so many winners, Atari had to devise an additional essay writing portion to whittle down contestants for the final tournament. Advertisements went out with pictures of the five bejeweled items. The games saw release in sequential order: Earthworld, Fireworld, Waterworld, and Airworld, with each game having its own contest. However, before the completion of Airworld, Atari found themselves sold. As a result, the competition was also canceled. Steven Bell won the talisman in 1983 at a tournament in California. In 1984, Michael Rideout won the chalice after the unexpectedly large response to the Fireworld release. Atari historian, Curt Vendel, reports that the Waterworld crown went to a secret winner after the game saw a limited release. The sword was the grand prize in a final tournament between the four winners of the four previous tournaments; however, as there was no final tournament, the sword was never handed out. Bell and Rideout, and perhaps the mysterious winner of Waterworld, received $15,000 payouts as a consolation for no longer being in the running for the final contest. Trammel bought Atari in 1984 during a slump in the gaming industry. Tramiel, a Polish immigrant, and survivor of Auschwitz, began as a typewriter repairman before founding Commodore International, which created the Commodore 64. In 1984, Tramiel was forced out of his own company and bought Atari. After purchasing the company, Tramiel shifted the focus of Atari from bottom line spending to marketing. He wanted the company to compete, but the move was not popular and Tramiel was not beloved by Atari fans. He also, some employees have said, hung The Sword of Ultimate Sorcery in his office, a prize he had not earned. Tramiel passed away in 2012 and rumors of his possession of the sword resurfaced; however, no one has laid eyes on the sword since the last Swordquest tournament in the ‘80s. What Happened to the Sword and Stone? What truly happened to the philosopher’s stone and the sword? No one seems to know. Fans still cling to the long-standing theory that Jack Tramiel claimed the sword for himself upon acquiring Atari. Vendel has stated that this rumor is unfounded. The historian claims that Franklin Mint melted down the sword and crown after the cancellation of the competition in ’84. Micheal Rideout gave interviews claiming that he saw the philosopher’s stone and the sword when he went to compete at the Atari headquarters in California, which counters some claims that the final prizes were never made. Rideout also states that Stephen Bell melted down the talisman for cash at some point after the 1983 contest. Fans continue to hold out hope that the philosopher’s stone and sword are out there, waiting to find an owner. 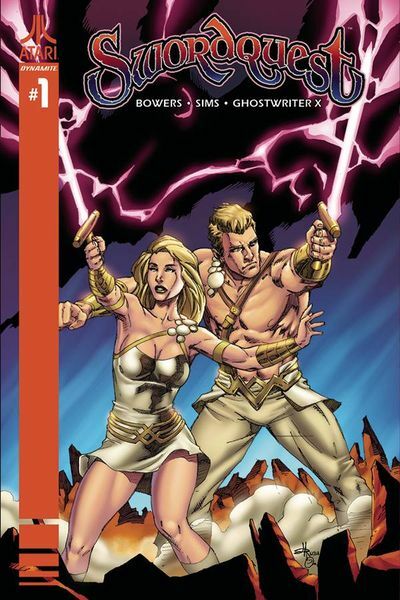 This fan theory led to the creation of the new Swordquest comic by Dynamite Comics. 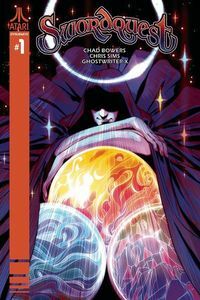 The new series is not a fantasy quest starring the robe-draped twins, but is instead a robbery adventure lead by aging geeks. Three friends who strove to win the sword in the ‘80s reunite in the aches, pains, and disappointments of adulthood with one goal: to find and steal the sword. It is a reclaiming of the lost promise Atari made three decades ago. The sword is out there, the characters believe, and they are coming for it. Will they find it? You’ll have to read the comic to find out.